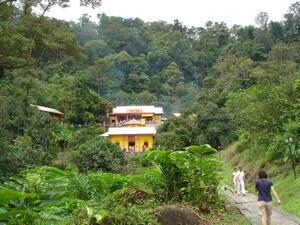 Nestled on the Paya Terubong Hills, in some quiet little spot sits a very old 130 Taoist temple called Cheng Kon Sze. 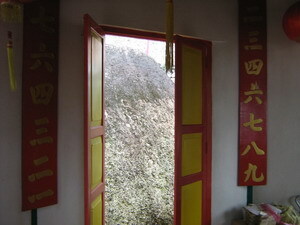 A simple untapped temple worshiped by the silent or quiet few Taoist devout devotees. During the Nine Emperor Gods Festival, Catherine rang me to inquire whether I would be interested to go up to 1002 Steps Temple or locals called it, Cheng Ji Chan. Peter (half body) and Junnie (half face) and Chandra looking down,wishing he gets permission to walk more as he waited for us. Sorry guys! What do you think, I jumped with joy as I have not yet gone up to Cheng Jee Chan or Cheng Kon Sze in my life.With Peter (pulau-pangkor.com) as our guest as he wanted to learn more about Chinese custom and traditions, he gladly tagged along. For Chandra’s sake as he is recuperating from a recent heart attack, all of us took the super cool van up the temple. 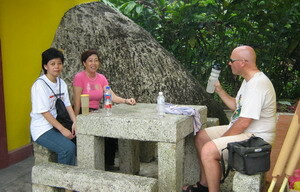 So Catherine, Catherine’s mum, Steffi, Chandra,Ben Khaw ( not in any pictures as he wanders off to take his own), my sister Junnie and me, the ever happy to go anywhere person and not forgetting the crazy white man from Holland ( the web master of pulau-pangkor.com) got up to Cheng Kon Sze. Just joking, he is actually funny guy! 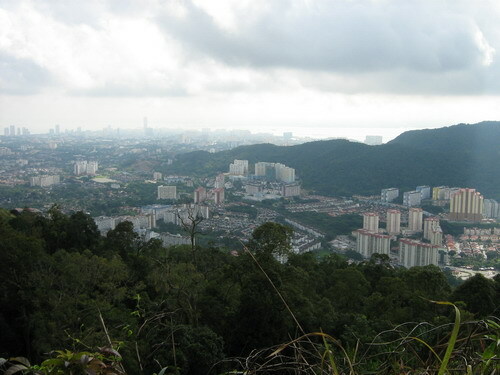 How pleased and thrilled we were when the van driver stopped to let us take this awesome shot of Penang. It was a good drive up the Cheng Kon Sze Temple, horning loudly all the way up as if we were some important VIP. But more because the hikers were making their way up on foot. 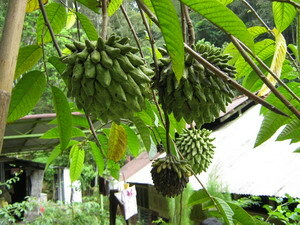 Have you seen this fruit, apple custard or locals called them Nona? 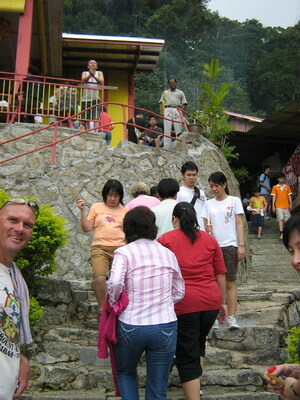 On the way up by foot to 1002 steps temple, my dad used to tell us, never to complain. Never utter the word, “why so far” or “why still have not reached the temple”. 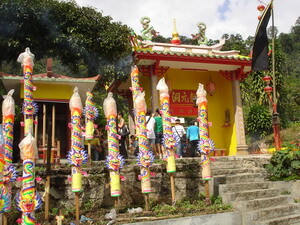 We see yellow, purple, red and green flower all over this cactus plan t in Cheng Kon Sze Temple, how awesome! But two ladies have no one to tell them and as they complained, they got tired and waved our van driver for help.Seeing how tired and broken these two old ladies were, all of us squeezed tighter into the van to allow both of them in. Despite having a seat, both never stop talking about how far or how tired they were. No wonder..I thought. 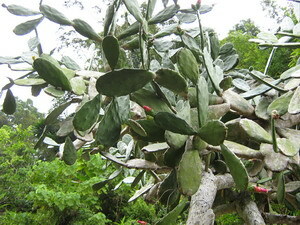 Baba pukul Nyonya plant is a delightful plant, did you know that? It blooms in the early morning in white. By mid afternoon, it turns pink. And in the evening, it is almost purplish. Such a refreshing plant, almost magical. The Happy Trio taking a breath of FRESH AIR! Sitting on the granite slab, such bliss! 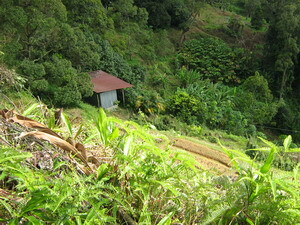 The natural vegetation, the multiple shades of green is a feast for our sore eyes. The fruits tree, flower plants, those I see when I was young makes me feel at home and child like. 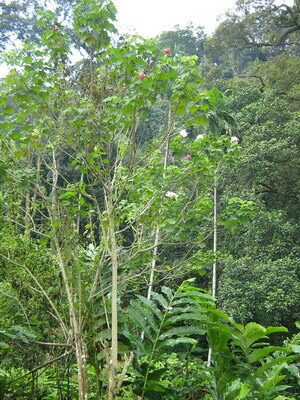 Huge galangal plant are everywhere. Galangal is still around in my neighborhood but I hardly see Baba pukul Nyonya Plant anymore. 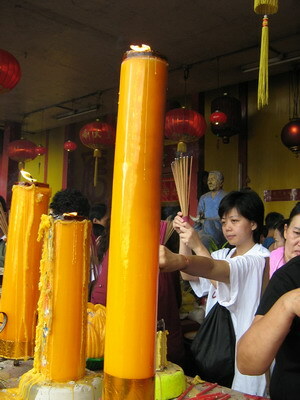 Reaching the temple vicinity, we were surprised to see a fair amount of devotees praying, shaking the fortune stick for health or wealth. Nice, and I look at the monk sitting on the tiger reminds me of my childhood. This priest or abbot must be Thai Siong Lok Kun, the healer or caretaker of many healer temples. There is even a road along Air Itam market place named after him. 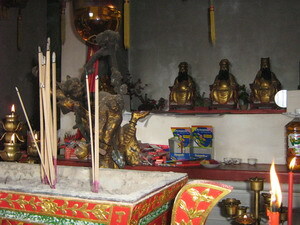 The Bronze Urn and Huge Lantern are as old as the temple. This is the town I grew up. My sister and me used to walk to the market from our home. I remember when we were young, we hated walking for 20 to 30 mins to the market. I do understand why there is a need for modern facilities. I only wish there will be some heritage buildings left to see. But it is going away too fast. This is the very reason I have now over 10,000 pictures. Amateur I may be, still they are my own hard work.Some locals having gone to China now understand that our own hometown Penang is far richer in heritage then China. Every street or town has a story to tell. And I have lots of story to tell as my dad and uncles told us lots when we were young. As we prayed and watched others, everyone seems so solemn and quietly talking to Nine Emperor God, Dao Mo the mother of Nine Emperor Gods . MMm..there is even the God of Education, so if you want your kids to be intellectuality inclined, come and offer prayer to this God. There are boxes of pencils. What they do is this. Take two pencils, make a prayer then next year come back to return 2 pencils too. But I saw devotees returning more, two boxes or placing cash or kind if they know they wont be returning. What is my fate or fortune, Uncle? After prayers, most will seek some spiritual guidance. 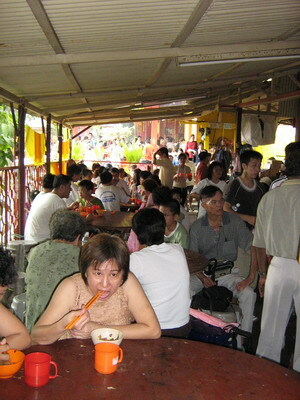 Tai Siong Lok Kun, according to my late father, is revered for answering or granting wishes. This one thousand and two hundred steps, supposedly should be one thousand and two steps. Not two hundred but somehow along the way, pronunciation or translation got lost.Seeking spiritual guidanceOn the table near the ticket giver, one can find a round container with fortune or fate stick. No idea what it is called, ( I dont claim I know everything, ok?) Anyway, taking that round container with stick, the devotee will bowed in front of the gods and virtually mutter for guidance. Then shaking the stick and till it jumps out, that is your answer. Take the fortune stick that jumped out to the counter. Take it to the corner of the temple, claim your fate sheet and look for someone who knows how to read to you. 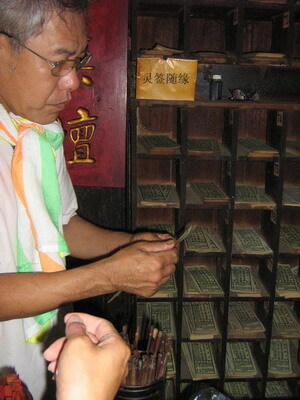 It is written in mythological mandarin so one must understand some chinese legends or myth. With that, the all knowing one will share with you in story form what is in store for you. up to you to translate the result, how about that? But sometimes, if they felt it is not a good fate, you will be guided to pray for better fate or luck. Great fried Vermiceli, porridge and dessert. A real treat! 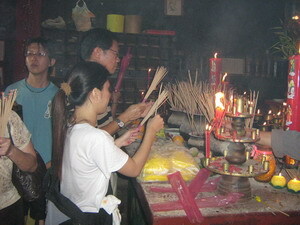 Hallo, I have just read with interest your account of your visit to Cheng Kon Sze Temple – as a fairly frequent visitor to Penang, I am always looking for something a bit different to see and I had never heard of this temple. So thanks for the information – I will enjoy the steps when I go! Yes, I love walking up there too. A great retreat for those who are keen.